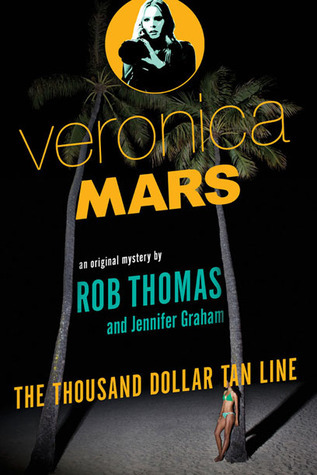 Ten years after graduating from high school in Neptune, California, Veronica Mars is back in the land of sun, sand, crime, and corruption. She's traded in her law degree for her old private investigating license, struggling to keep Mars investigations afloat on the scant cash earned by catching cheating spouses until she can sore her first big case. Now it's spring break, and colleges students descend on Neptune, transforming the beaches and boardwalks into a frenzied, week-long rave. When a girl disappears from a party, Veronica is called in to investigate. But this is not a simple missing person's case. The house the girl vanished from belongs to a man with serious criminal ties, and soon Veronica is plunged into a dangerous underworld of drugs and organized crime. And when a major break in the investigation has a shocking connection to Veronica's past, the case hits closer to home than she ever imagined. A co-worker read this and thought it was pretty good. You had me at Veronica Mars. Then I found out Kristen Bell narrates the audiobook. And you had me at Kristen Bell. And then I read the description, with the story leaving off right after the Veronica Mars movie, and I was all like, "Heck, yeah, I'm going to read this book!" That last sentence got a little weird. Please excuse my inner (and apparently outer fangirl :) So, yes, I'm a HUGE fan of Veronica Mars, and while I didn't really jump at the chance to read a spinoff novel (which, let's face, are very rarely worth reading), I decided to give this audiobook a listen because Kristen Bell is totally amazing. Thank goodness I gave it a chance! It was like there were more episodes. Or another movie. Or that Veronica Mars was not gone. She was still in Neptune, being awesome and snarky and fierce, solving crimes. Spring break in Neptune is not for the faint of heart. Keith Mars is still in the hospital after being nearly killed by a hit and run. Veronica has taken up her post at Mars Investigations, and with the help of her bestie Mac, is trying to keep the business open while her father convalesce. Then a girl goes missing, and a bigwig hotel owner hires Veronica to solve the crime (against the wishes of the totally inept Sheriff Lamb). Same old, same old in Neptune. I don't want to give it away too much, so I'll stop there. What's the fun of spoiling the mystery? Just do yourself a favor if your a "marshmallow", and pick up the audiobook today. Bell knocks it out of the park (Of course she does! She's Kristen Bell!) And the writing isn't half bad. And if you like Veronica Mars (What? You have watched it? That is your assignment this holiday season. Got to your local library and check out the first season and watch to completion. I dare you not to run back for the other two!) you should SO be watching iZombie. It's Veronica Mars with zombies. Oh my goodness.